On Target or Off the Wall? Dr. Laura Schlessinger, the mega-popular star of The Dr. Laura Show, has been called many things by many people from diverse sides of the cultural and religious spectrum. -- A voice of fresh air in a polluted atmosphere. -- A grounded moral absolutist. -- The therapeutic equivalent of Rush Limbaugh. -- A prophetess for our times. -- A petite, blond, latter-day version of Moses on the mountain.Some appreciate her voice in the wilderness stance on morals which she defines as biblical: I'm presenting standards like they're mine. I mean, you know -- they're biblical I'm reiterating them. Others believe she is a self-righteous prude capitalizing on shock-jock techniques.But for Christians -- and finally all others as well -- there is only one standard: The Word of God. 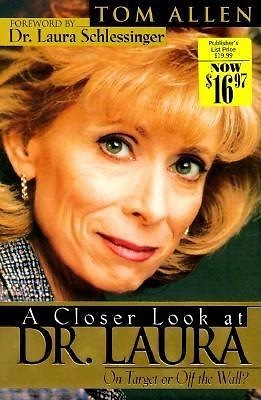 That is the ultimate scrutiny.A Closer Look at Dr. Laura is a thoroughly researched and documented review of her beliefs and advice as revealed through her four books and radio program, and set against the clear teachings of both the Old and New Testaments.